Those sleeves. Those sequins. That neckline. 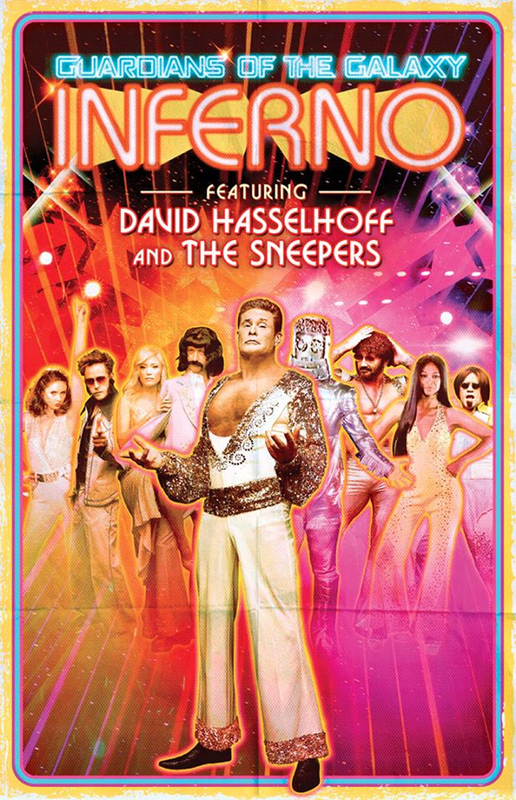 Seriously, if this music video is even a tenth as retro-tacular as the poster for David Hasselhoff’s Guardians Inferno is, it’ll be the best thing Marvel has put out this year. Yes, that really is Karen Gillan, Chris Pratt, Pom Klementieff, Sean Gunn, Dave Bautisa, Zoe Saldana, Michael Rooker, and presumably either Vin Diesel or Bradley Cooper dressed up as a silvery robot in the background. This is incredible. It could only be improved by everyone getting their Dazzler on and running around in roller skates like they’re ready for some goddamn disco.